Um, when are you going to update this soon? .O. 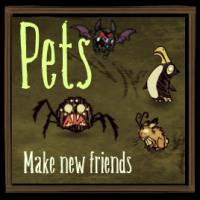 What I think you should add to the AMAZING mod is more pets like the Tree Guard, DeerClops, Bees, Butterflies, Birds And Bearded bunnies( When Insane). Also I think you should add a animal pen and a aquarium and tank to have Pet Fish. and to keep them in and to stop them from going down into caves and also you should add a food bowl/dish so that you don't have to feed them by hand. Also if you catch a bunny in a trap if you feed it rabbits in your inventory slot it should be auto tamed. 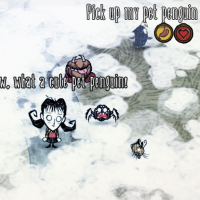 Thank you for the amazing mod and for making my don't starve world even better. Hi, how can i change the pets' size ? Attempt to call method "SetAbsorbArmor"
Hey, Im not sure if your working on this mod alot but. I really hope you can fix this! it's so anoying have a pet spider when you CANT KILL OTHERS SPIDERS WITHOUT LOSS 5 SANITY! .-. Best mod ever. Guys and gals, don't hesitate another second, download it !